Warm & Cozy Cabin w/Deck on Top of the Blue Ridge! Looking for a relaxing getaway? Escape to the Blue Ridge Mountains and stay at this rustic 2-bedroom + loft, 2-bathroom vacation rental cabin in Fancy Gap, Virginia. 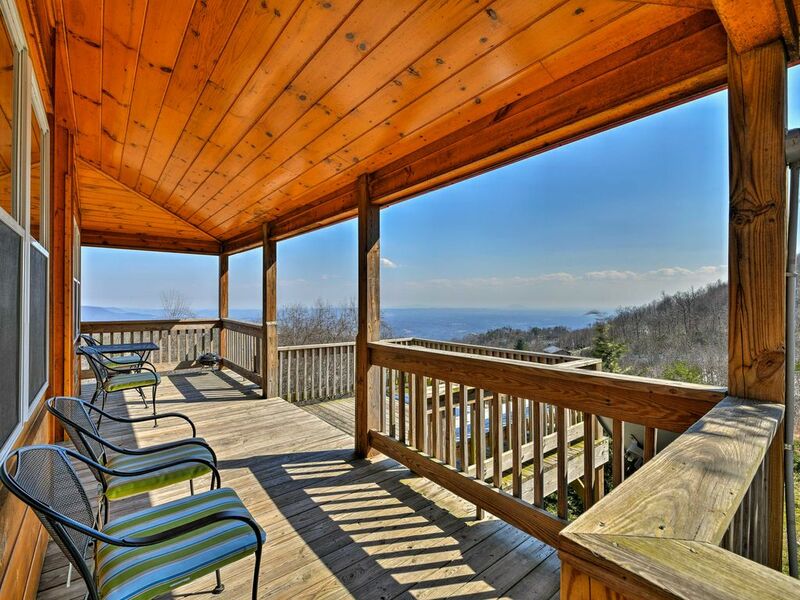 Experience the breathtaking scenery and long-range Piedmont views from the spacious deck or porch. Whether you’re looking for a peaceful retreat or thrilling outdoor adventures, Fancy Gap has something for everyone! You’ll love the cool summer weather, mountain music, culture, unique shopping and the friendly people. Come enjoy the fish pond, covered bridge and waterfalls the Reflections neighborhood features! You’ll love your semi-secluded home-away-from-home surrounded by towering trees and stunning views. Inside, this charming 1,400-square-foot unit boasts free wireless internet, Satellite TV, a fully equipped kitchen, washer and dryer, comfortable furnishings, pastoral decor and a gas fireplace. Ease off your boots after a long day exploring the Blue Ridge Mountains and sink into the Italian leather reclining sofas of the inviting living room and warm up your toes by the fireplace while you catch up on your favorite shows. The open-concept layout makes it easy to visit with your loved ones so you don’t miss out on any of the fun! Set out appetizers on the kitchen island for the group to enjoy while you whip up a hearty home-cooked meal with stainless steel appliances and ample granite counter space aiding you in your culinary endeavors. Savor your meal at the 6-person dining table and spend quality time together, sharing highlights of the day. When you’ve had your fill, step outside to the spacious deck for some fresh air and view the stars like never seen before. Call it a night and retreat back inside to slip under the covers of the comfortable beds found in the master bedroom, second bedroom, or loft, where you’re sure to enjoy a peaceful slumber. Experience America’s favorite drive! Fancy Gap is located next to the Blue Ridge Parkway at mile marker 199.5 on US Highway 52 and at Exit 8 off Interstate 77. The parkway runs from Virginia all the way to Cherokee, North Carolina, offering beautiful scenery, overlooks, and extraordinary vistas throughout. Take your time cruising the road at 45 miles per hour being sure to stop off at a few exits to take in the art and culture of the Appalachian and Smoky Mountains. Enjoy local fare at the Lake View Restaurant and The Gap Deli in Fancy Gap, VA, or visit the local vineyards or Trio in Mount Airy, NC for a fine dining experience. If you travel to Hillsville, the Rio Grande, The Dutch Oven, and The Mason Jar are local favorites. The property is located within a short drive to the New River State Park, where rafting, canoeing/kayaking, and horseback riding are available. Wineries close by are Chateau Morissette and Shelton Vineyards. Golf is available at the Skyland Lakes Golf Club, Old Mill Championship Golf Course & Resort, Blue Ridge Country Club, to name just a few. Historic Hillsville and Galax, VA, are a short car ride away, as well as the folksy town of Mt. Airy, NC. Travel up the Blue Ridge Parkway to the famous Mabry Mill. If you’re itching to get out of the cabin, but don’t want to do anything too extreme, pay a visit to Peaceful Heart Alpacas and get up close to the adorable animals to the point you can even pet them! Peruse the shop for wool or comfortable clothing made from alpaca fleece and talk with the friendly owners to learn more. - Amenities include a fully equipped kitchen with stainless steel appliances and granite countertops, Monopoly, Clue, Dominoes, cards, Jenga, Chinese checkers, Mancala, books, DVD/Blu-Ray player with a wide DVD selection, in-unit laundry machines, a flat-screen satellite TV, free WiFi, gas fireplace, spacious deck with views, driveway parking for 2 vehicles and more! We will be coming back! Can't say enough good things about this place! You always expect a little less from vacations than what is promised in the pictures, but our expectations were exceeded for this weekend getaway! The cabin was absolutely immaculate and felt like home the instant we walked in. The views were so breathtaking for morning coffee on the deck it was well worth bundling up and enduring the chilly weather. At night while we grilled on the deck with our wine, the lights from the distant city below made you feel like you were in a movie. The kitchen was well supplied with all necessary cooking utensils to stay in all weekend after a short drive for groceries. The neighborhood is extremely nice and you feel completely safe to go for a walk! This is the perfect getaway with your significant other to reconnect and spend quality time together. We are already thinking about our next trip! For an added bonus, the cabin is perfect for a couple to make themselves at home but after visiting we realize it would be perfect for us to spend a family vacation with our son, his wife, our daughter, her husband, and their little ones. What a cozy and relaxing place. This is a wonderful cabin in the wood...off the beaten path but close to the Blue Ridge Parkway and Mt. Airy NC. There is a gas fireplace, plenty of DVD's & games (although we never turned on the TV). The kitchen & bathrooms are well stocked. We had 4 adults, so there was plenty of room for all. Plan to get away from it all & unplug while you are here. La pasamos SUPER bien... hermosa cabaña en un lugar espectacular. La recomiendo para pasar un momento hermoso en familia y/o amigos. It was marvelous. Love the cabin! I have stayed in this cabin twice and absolutely love this place. Just enjoyed a New Year’s reunion with college roommates and our wives. The cabin is immaculately clean and so cozy. The Christmas decorations added to the beauty of the place. Could not recommend this placer any higher. Will definitely be back. We loved the cabin, the view, the area and enjoyed hiking and exploring. The cabin is comfortable, clean, great bed, nice linens and a nice kitchen. The manager of the property Amos Akers was very helpful and really added to the enjoyment of our trip. When we arrived we were unable to start the gase fireplace due to the remote having dead batteries. Amos made a special trip to replace them. We then found out that the remote to the TV also had dead batteries in it. We couldn't watch anything on TV due to all movies being on demand and the owner would have to pay for them through their Direct TV package. There wasn't a DVD player, the Internet was so spotty that only one of us could be on our phone email at a time. There were only two games - Operation and a 1000 piece puzzle. i think adding a DVD player, a deck of cards and checking to make sure batteries are working in the remotes would have greatly added to our trip We were there four nights and it would have been nice to have played games and/or watched a movie. The other suggestion is to provide a scrub brush to wash the pots and pans. There was only a kitchen cloth and we really had to get inventive to clean the pots. The cabin is lovely and it would take a few little tweaks to make it a 5 star rating. "Mr. Wells, thank you so much for your feedback on our home. We welcome and encourage suggestions so that we can continuously improve our guests' comfort and respond to their needs. In light of your suggestions, we have added several games - Monopoly, Clue, Dominoes, cards, Jenga, Chinese checkers, Mancala, as well as a DVD/Blu-Ray player with a wide DVD selection. I hope that you will stay with us again and take advantage of the added amenities. I did want to mention there is no problem with the WiFi, but the cell coverage is 3G at most in the area, and unfortunately, that is beyond our control. If I could correct that, rest assured I certainly would!